DULUTH, Ga. (Sept. 22, 2017) — AGCO Corporation (NYSE:AGCO), a worldwide distributor and manufacturer of agricultural equipment, will showcase the new RoGator® C Series self-propelled row crop applicator, the innovative and hard-working Massey Ferguson® compact and utility tractors plus the full line of Hesston by Massey Ferguson® hay equipment at the Sunbelt Expo, October 17-19 in Moultrie, Ga.
“AGCO will have equipment on display that can help everyone from commercial applicators and row crop farmers to people with small acreages, tackle challenges and solve problems in their business or on their land. And, visitors will get a better idea of how our products can be used to meet their needs, because this year we have a unique exhibit that displays the equipment in a fun, interactive way they probably haven’t seen before at a farm show. 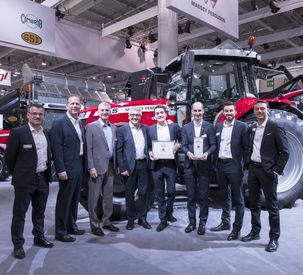 The AGCO lot itself is something to see,” says Ash Alt, regional manager for AGCO. Alt also points out, commercial applicators and row crop growers who are concerned about properly applying herbicides to control resistant weeds will want to learn more about the new technology-loaded, user-friendly RoGator C Series applicator while at the show. AGCO’s primary exhibit is Lot # D-4-143. AGCO equipment experts will be available at the lot and in the demo fields to answer questions about the full line of equipment and this year’s featured products and activities. This new row crop applicator is creating a lot of buzz and is a ‘must see” while at the show. The RoGator C Series with the all-new LiquidLogic™ system reduces the potential for off-target application, makes cleanout faster, easier and more thorough and reduces product waste. This state-of-the-art application system helps operators simplify their jobs while increasing their efficiency. 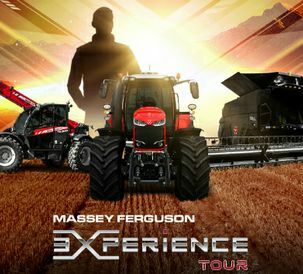 AGCO invites farmers, contractors and homeowners to test drive Massey Ferguson compact and utility tractors each day from 10 a.m. to 4 p.m. at the Ride & Drive field. It’s an opportunity to see firsthand how these versatile, powerful utility tractors handle different implements and daily chores with ease. Attendees also will have the chance to operate compact tractors that are small but powerful and perfect for landscaping, grounds keeping, nurseries and farming activities. Trams depart from the Tram Station (North of D-1) to take visitors directly to and from the field demos. 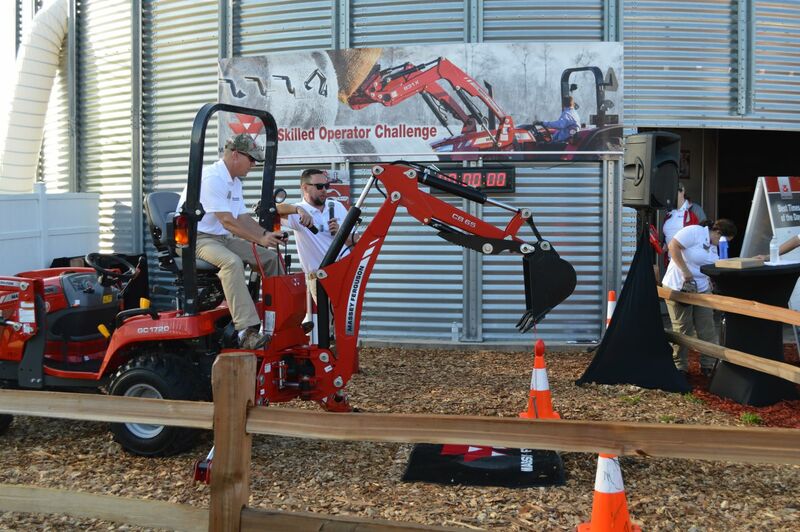 Show visitors can test their skills operating the convenient, easy-to-use backhoe attachment on the Massey Ferguson GC1720 compact tractor. 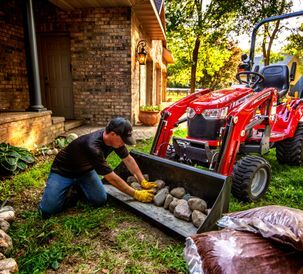 This 25-hp compact tractor offers bigger tractor features in just the right size for projects around the acreage or landscaping business. The backhoe is designed to be the most versatile, stable and easy-to-operate backhoe in its class. Complete the challenge and win a prize! Visitors to the AGCO lot should be sure to register for the chance to win a new lawn mower. The winner will be announced at 2:30 p.m. from the Farm Credit Roving Stage near the Main Gate. As the hay industry’s leading provider of innovative forage harvesting equipment, Massey Ferguson is proud to be the title sponsor for the Southeast Hay Contest. The competition is the premiere forage quality contest in the Southeast, designed to demonstrate the potential to produce high quality hay and baleage, showcase the management abilities of Southeastern growers, and highlight the technology and equipment that make it all possible. Entries come from hundreds of producers across 13 states and may be submitted until Thursday, Sept. 21, 2017. Winners will be announced at a special ceremony on opening day of Sunbelt Expo. The Grand Prize winner of the Southeast Hay Contest receives use of a new Massey Ferguson DM Series Professional disc mower or a Massey Ferguson RK Series rotary rake for the 2018 hay production season, plus a $1000 cash prize. Massey Ferguson also is proud to mark its 20th anniversary of sponsoring the Sunbelt Southeastern Farmer of the Year contest, providing the winner with one year’s use of a tractor from Massey Ferguson’s full line of tractors. The Southeast Farmer of the Year contest recognizes growers from across 10 states for their “excellence in agriculture”. Winners will be announced at a special ceremony on opening day of Sunbelt Expo. For more information about the RoGator C Series row crop applicators and the exclusive LiquidLogic system, visit www.Challenger-ag.com or your local Challenger® dealer. To learn more about Massey Ferguson equipment, visit www.masseyferguson.us. ©2017 AGCO Corporation. Massey Ferguson is a worldwide brand of AGCO. Challenger is a registered trademark of Caterpillar Inc. and is used under license by AGCO. RoGator and Hesston by Massey Ferguson are registered trademarks of AGCO. LiquidLogic, is a trademark of AGCO.